This year, for the first time, the National Palliative Care Registry™ released a special publication overviewing the current landscape of hospital-based palliative care in the United States. The publication, entitled How We Work: Trends and Insights in Hospital Palliative Care, documents the field’s progress over the past 7 years and highlights opportunities for improvement in hospital palliative care. 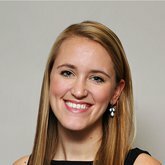 Advocating for your palliative care program can be difficult (or perhaps impossible) without the proper data to back it up. Many palliative care programs are seeking new ways of obtaining additional resources for their programs, but often lack the comparative data to prove their need. How We Work overviews many features of palliative care programs – from patient encounters to staffing models to consult timing – providing the data points that palliative care teams need in order to advocate for their programs. How We Work can also be used as a foundation for starting a new palliative care program, especially when you’re seeking out information on what the average palliative care program looks like and how it works. or example, your palliative care program at a 500+ bed hospital is interested in hiring an additional 1.0 full-time equivalent (FTE) advanced practice registered nurse (APRN) to diversify your team. You turn to page 5 of How We Work and see that programs at larger hospitals have an average of 2.0 FTE APRNs on their teams and that most of the growth in team size over the past seven years is attributable to an increase in APRNs. Using this information, you can now show that your program has fewer APRN FTEs when compared to similar sized peer hospitals, providing objective backing for your request. Combine those findings with the fact that palliative care programs with more staff are able to see a larger percentage of annual admissions and the importance of meeting national staffing recommendations, and now you are in a better position to advocate for your palliative care program. In addition to making the case and advocating for program resources to the C-Suite, publications like How We Work are great for hospital administrators to use for strategic and long-term planning for their organization. The C-Suite and the hospital’s board of directors, as well as other stakeholders, lead discussions on operational infrastructure and system integration that can greatly influence the future of the palliative care program. As hospitals plan their strategic direction, palliative care should remain an important piece of the puzzle. How We Work provides data to support leadership’s interest in hospital-based palliative care. How We Work reports national averages and top quartiles, but does not report specific “benchmarks” for the field. Nonetheless, palliative care programs can use the findings presented and set their own internal targets for self-assessment. The findings can also motivate internal team discussions around programmatic priorities. Some programs may even tie national operational metrics to their quality improvement strategy. For example, in 2015, large hospitals (500 or more beds) provided palliative care consultations to 3.7% of all hospital admissions. Your program prioritizes palliative care service penetration in order to reach more patients in need and uses the data in How We Work as a basis for the target. Using this information, your program now aims to reach a palliative care service penetration of 5.0% over the next year, a 35% increase over the national average for a hospital of this size. For grant applications or fundraising activities, whether it’s donor outreach or your foundation’s annual gala, be sure to include How We Work in your package of materials. How We Work demonstrates the importance of palliative care programs in hospitals. It also helps legitimize your palliative care program’s continued work and strengthens proposals for program growth. Use the publication to help conceptualize how far you have come and where you hope your palliative care program will go. At the heart of it, How We Work is a great resource on the programmatic and operational features of hospital-based palliative care programs. Whether you are looking for a data point to contextualize hospital palliative care in a research proposal or a graphic to brighten up a PowerPoint, How We Work is a great resource. For example, you are interested in submitting a research proposal on pulmonology and palliative care and you need some quick statistics on what percentage of palliative care referrals come from pulmonologists. Check page 13, we’ve got you covered. One of the best ways to influence the current understanding of palliative care is to contribute your data and participate in the Registry’s annual surveys. The National Palliative Care Registry™ is the only platform tracking the nation’s palliative care programs and operational features. The National Palliative Care Registry’s latest publication How We Work: Trends and Insights in Palliative Hospital Care provides hospitals and palliative care programs with a comprehensive profile of palliative care operations, and is an essential resource for the continual development of the field of palliative care. 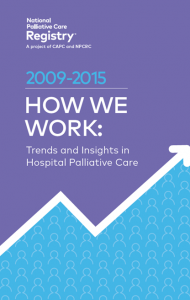 Download a copy of How We Work: Trends and Insights in Hospital Palliative Care now. The National Palliative Care Registry™ is a joint project of the Center to Advance Palliative Care (CAPC) and the National Palliative Care Research Center (NPCRC). The Registry has been collecting data on palliative care programs since 2008. Currently, over 1,000 palliative care programs have participated. Participation in the Registry is free and open to all palliative care programs across the continuum of care – including hospital, home, long-term care, and office practices. By participating in the Registry, you will add your program data to the national profile of palliative care, receive access to custom reports that measure your program’s progress year-to-year, and assess your program through comparisons with peer programs. Your participation also helps promote standardization and improve the quality of palliative care. Dumanovsky T, Rogers M, Spragens LH, Morrison RS, Meier DE. Impact of Staffing on Access to Palliative Care in U.S. Hospitals. J Palliat Med 2015;18(12):998-999. Spetz J, Dudley N, Trupin N, Rogers M, Meier DE, Dumanovsky T. Few Hospital Palliative Care Programs Meet National Staffing Recommendations. Health Affairs 2016;35(9):1690-1697.